I met my daughter when she was nine days old. And we met, not in a sterile hospital maternity ward, but in the bright, cheerfully painted “baby room” at the Gladney Center for Adoption in Fort Worth, Texas. Many long years my husband and I had waited to hold a child, and now she had arrived just as we were about to despair. Of Hispanic heritage and weighing less than six pounds, she was a tiny bundle of flailing arms and a mop of thick black hair. By that time, I already knew something of the Gladney Center’s namesake, Edna Browning Jones (Kahly) Gladney (1886-1961), for I had written about her in one of my first books, a history of Grayson County, Texas, where she started her career in social work. Always interested in child welfare, Edna, in 1927, volunteered to temporarily take charge of a failing, bankrupt, forty-year-old Fort Worth adoption agency. She was still there more than three decades later. Only a few family members knew that Edna shared a then-shameful secret with many of the thousands of children who passed through the doors over those decades: she was illegitimate, the daughter of an unwed girl barely seventeen years old. But unlike the many thousands of birth mothers who also came under her loving care, she could not have children herself. She fought for the rights of them all, helping to secure the first birth certificates in the Southwest which no longer cruelly but legally branded children as born out of wedlock. She campaigned for full inheritance rights for them and battled grey and black market adoptions. For her birth mothers and in memory of her own mother, Edna Gladney helped change public perception of them as “scarlet women,” too stupid or too immoral to know better than to break society’s sanctions. Her work brought her many honors and two movies based on her life, including 1941’s Blossoms in the Dust, starring Greer Garson. 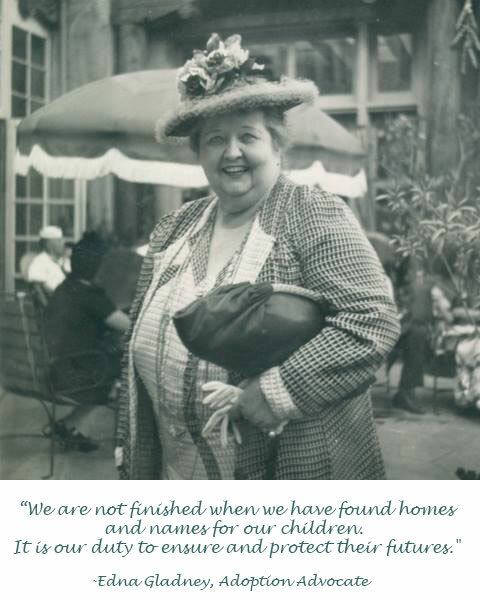 Today the Gladney Center for Adoption continues Edna’s work in new directions. There is a strong emphasis on finding “forever families” for Texas’ foster children, while the international adoption department focuses on China, Colombia, and Taiwan. Birth mothers are helped to create their own “bright futures.” Adoptees such as my daughter raise funds and travel to orphanages in other countries to bring light and cheer and hope where they are so badly needed. This year Gladney celebrates 130 years of helping more than 33,000 children find the warmth of a loving family. Find out more about their story—and hers—in Adoption Activist Edna Gladney, published by History Press.